Your "go-to" source for public education policy and reform in Oregon. Have questions? Ask us! Educating Kids, Yes It Is Personal! On Wednesday, February 5th, 2014, two members of OSOS, both veteran classroom teachers, visited, by invitation, the office of Senator Mark Hass, chair of the Senate Education and Workforce Development Committee. Senator Hass has worked on some positive pieces of legislation related to education, so we were hoping we might get at least a listen regarding teacher concerns about the consequences in Oregon’s middle and elementary school classrooms regarding the focus on high stakes standardized testing and implementation of Common Core State (sic) Standards. That meeting was not very positive. Here, one of the teachers writes an open letter to Senator Hass about that meeting from the teacher’s perspective. A private email was sent to the Senator’s assistant earlier this week expressing disappointment in the meeting and asking what the Senator’s position is on moratorium or repeal of the Common Core in Oregon. At the time of this posting, there had been no response from his office. I am writing to express my extreme disappointment with our meeting on Wednesday, February 5th. When I spoke at Beaverton’s 40/40/20 meeting about my frustration with sloganeering over true action to improve education for Oregon students, what I said clearly struck a chord with the audience as evidenced by the fact that I was the only speaker who received a round of applause. Afterward, when I approached you and spoke to you in private, I expressed my dismay at Oregon Deputy Superintendent Rob Saxton’s assertion that teachers support the current reform agenda. I told you that I could put you in touch with many, many teachers who, like myself, feel that these policies not only do not help students but in fact are harming them. You invited me to make an appointment with your assistant to come to Salem and speak to you. I took his card that night and contacted him the next day via email. My fellow teacher, Tricia Snyder, and I arrived about five minutes late. That was totally my fault because right as I was dismissing my sixth graders, a former student who just started high school this year stopped in to see me. He’s a great kid. I’ve known him since he was in my pre-K class in summer school, his first time in a school. He didn’t even know how to write his name when he got there but 3 weeks later, he could write it perfectly. He was in my class in 5th grade too, and attended the elementary school where I work during the years in between. He wasn’t the very best student, but he was a hard worker and a good, average student. He was a happy kid and had lots of friends. He was very outgoing. I always thought he’d be great on stage. He had a lot of struggles during those years. He had to learn English. His mother was almost deported and had to return to Mexico for a year. She took him with her. When he came back, he told me he didn’t like school there because “they hit you”. He comes and sees me every once in awhile, usually when something’s bothering him and he needs help. That was the case on the Wednesday before I had the meeting with you. I asked him how high school was: “Better than middle school, right?” I joked. His answer was no. He hated high school. I asked him why. He told me it was boring, but I dug a little deeper and he told me he was failing two classes. He said it was because he had gone to Mexico with his family this year, like he always does, and when he got back he was far behind. Now he is trying to catch up so he doesn’t fail and thus not get the credits he needs to graduate. I offered to help him after school. I told him I had to leave right then (to meet with you, Senator Hass) but he said he’d come back Friday. I hope he does. I wouldn’t have left normally, but I had hoped that you might listen to me and my concerns about how current “reforms” are failing kids like him and that I would be helping him by meeting with you. When we arrived you weren’t there yet, but Tricia and I sat down at a table with the two legislative assistants who greeted us. We were told that you would join us shortly, as you were still in committee. We expressed some of our concerns and the assistants began to try and explain to us certain things about how government works, how schools work, and to fill us in on some current issues in educational policy. I may be off base, but at that moment I felt a little insulted that someone who is younger than my oldest child was explaining to me, a 26 year veteran teacher in the public schools with a Master’s degree equivalent, who has been politically active since the 1970s, how the public schools and government function and what the current issues are. I felt we were being talked to, not listened to. I felt we were being interrupted. And you were still nowhere in sight. I told them that my number one concern is the use of high stakes testing. I asked why we needed to have a common set of standards for every student when students are so different. 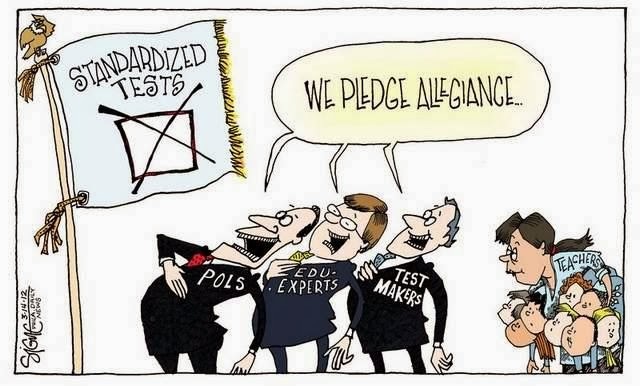 I was told that if we didn’t have standards and tests, there would be no way to measure “accountability”. Tricia asked exactly what accountability meant. We were told that teachers had to be accountable, that we can’t have bad teachers in our schools. Tricia stated that there is a system of accountability in place: that’s what principals and other administrators are for. I told them that’s what locally elected school boards are for as well, and that we are also accountable to parents. We were told that school districts get a lot of money from the state and therefore must be accountable to the state for how they use that money. Things I wish I’d said moment: Where does the state get that money? Isn’t it from the citizens, the very ones who should be allowed to have the local control I spoke of? I responded, “That is not what I said. You’re mischaracterizing my statement. I said what I want is an end to all high stakes standardized testing.” He got defensive (as I felt he had throughout the entire conversation whenever we contradicted his assertions) and said something to the effect that he was just kidding and trying to “lighten the mood”. Then you pointed your finger at us and told us, “Don’t beat up on these guys, they’re good guys!” I replied that I was sure they were but that I had come to Salem to speak with YOU. You had, in fact, invited me to do so. I brought some reading for you as well. Supporting articles from education experts like David Berliner , Stephen Krashen and Yong Zhao were among the papers in my folder. You told your assistant to leave the folder on your desk, that you had to pick up your son in Beaverton by 6:00 (it was now about 5:20) and that you needed to go. You may have been in the room for 5 minutes, tops. You popped in and dashed out. You never even sat down at the table with us. I know you’d been at an important meeting. So had I, before I left school. I cut it short to talk to you. I know you had a kid there waiting, depending on you to be there. So had I, before I left school. I drove 40 minutes each way to come and see you. For Tricia, the drive was over an hour each way. We had hoped to have a real dialogue about the false hopes and misguided actions that are driving this runaway train. Instead, we heard a lot of platitudes and excuses about why things must be the way they are. And we didn’t even hear them from you. We felt that our concerns as teachers were simply dismissed. Again. And we are tired of it. At least it’s good to know where your office stands. Putting the Public Back in Our Public Schools! Come Join Us on Facebook! Click on the picture above. Thanks!